Instagram has received a new update for its iOS and Android app which puts in a new feature of Focus for the users who click pictures in the Instagram Stories as well as in the post. The new feature works quite similar to the portrait mode which can be seen in quite a lot of phones these days. The update is available for Android on the Google Play store and as Instagram version 39.0 for iOS users. To access the focus feature on the Instagram app, users will need to open their camera on the application. They will be able to notice the focus option right beside the superzoom. The focus feature will work both for the front and the rear camera. The best part is a user will be able to shoot videos as well as photos. The users can tap on the screen to click a photo and tap and hold to record a video. Later the photo can be used normally and can also be edited by placing stickers, emojis etc. Further, the image can be either posted, put up on the story or can be sent to someone via the Direct Message. This feature is said to be competing with the likes of Apple’s portrait modes which is known to blur the background and focus on the subject. While the devices use a dual camera setup, the Instagram camera does it using the software. The feature is currently available for devices like iPhone SE, 6S, 6S+, 7, 7+, 8, 8+, X and on selected Android devices. Besides this focus feature update, Instagram is also rolling out a new feature which is the @mention sticker for the iOS users. 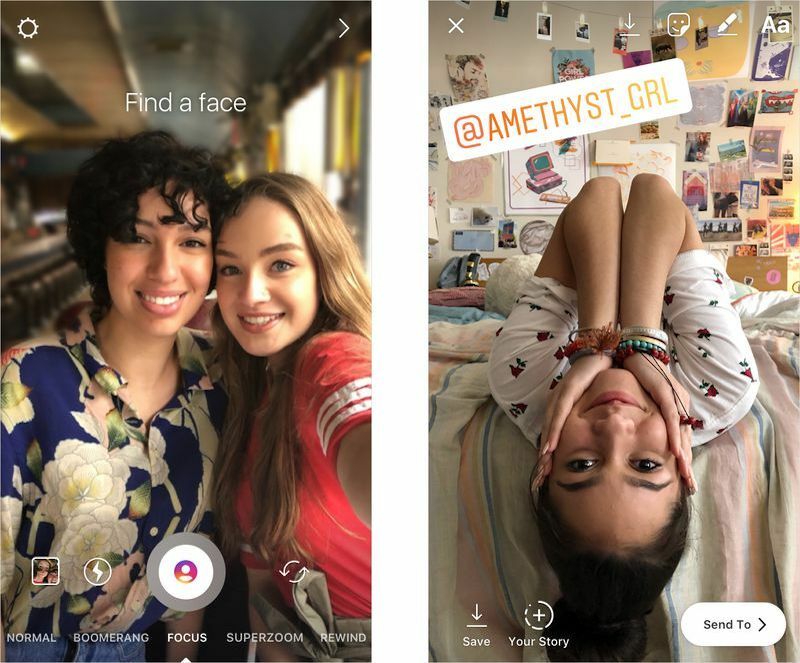 Now, iOS users will easily be able to mention and connect with other users in their Instagram stories by simply dragging the @mention sticker to their story and typing in the person’s name, whom they want to mention. The @mention is also easily editable like Instagram’s other stickers.